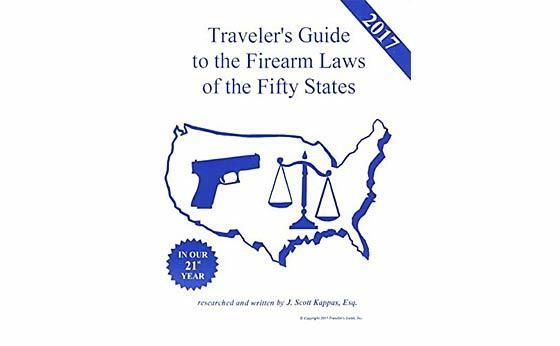 Note: I have found the following guide to be extremely useful, “Traveler’s Guide to the Firearm Laws of the Fifty States”. Each state is covered separately to inform of their own, perhaps unique, firearm laws. Lists of current reciprocity between states are also helpful. The book is updated each year with any changes to law. … across state lines for lawful purposes except those explicitly prohibited by federal law to include convicted felons; persons under indictment for felonies; adjudicated “mental defectives” or those who have been involuntarily committed to mental institutions; illegal drug users; illegal aliens and most non-immigrant aliens; dishonorably discharged veterans; those who have renounced their U.S. citizenship; fugitives from justice; persons convicted of misdemeanor crimes of domestic violence; and persons subject to certain domestic violence restraining orders. Therefore, no federal permit is required (or available) for the interstate transportation of firearms. Travelers must be aware of these laws and comply with legal requirements in each jurisdiction. There is no uniform state transportation procedure for firearms. Under FOPA, notwithstanding any state or local law, a person is entitled to transport a firearm from any place where he or she may lawfully possess and carry such firearm to any other place where he or she may lawfully possess and carry it, if the firearm is unloaded and locked out of reach. In vehicles without a trunk, the unloaded firearm must be in a locked container other than the glove compartment or console. Ammunition that is either locked out of reach in the trunk or in a locked container other than the glove compartment or console is also covered. Travelers should be aware that some state and local governments treat this federal provision as an “affirmative defense” that may only be raised after an arrest. As soon as any firearm is carried on or about the person, or placed loaded or readily accessible in a vehicle, state and local laws regarding the carrying of firearms apply. If you seek to carry or transport firearms in such a manner, it is advisable that you determine what the law is. The exceptions to this rule apply mainly to transportation of handguns and so-called “assault weapons.” The myriad and conflicting legal requirements for firearm transportation through the states make caution the key for travelers of which you must consult local law. If you travel with a trailer or camper that is hauled by an automobile, it is advisable to transport the firearms unloaded, cased and locked in the trunk of the car. If your vehicle is of the type in which driving and living spaces are not separated, the problem becomes one of access. If the firearm is carried on or about the person, or placed in the camper where it is readily accessible to the driver or any passenger, state and local laws regarding concealed carrying of firearms may apply. It is recommended, therefore, that the firearm be transported unloaded, cased, and placed in a locked rear compartment of the camper or mobile home, where it is inaccessible to the driver or any passenger. Mr. Car jacker, please wait until I go to my trunk, unlock the gun case, find the ammo, load the gun, … so I can stop you from taking my vehicle with my kids in the back seat. So, have alternative weapons, or don’t travel to unfamiliar or suspect locations. Where would that be – in my own neighborhood. Not sure if you’re poking fun or not, but I’m simply presenting the facts as they relate to transporting firearms across state lines – as in, going on a trip, vacation, or whatever-wherever whereby you may wish to bring a firearm. If one chooses to carry on one’s person while traveling outside your own state locale (where presumably you’re ‘legal’), then you WILL be subject to the other state’s laws – even though FOPA (as described) allows transportation thereof – given the stipulations cited. Yup, some tongue in cheek. Gun laws should be consistent throughout the country. More and more little potentate governors are trying to bend the Second Amendment to suit their own dictates against law abiding citizens. Wow, driving from the most-stupidest-state-ever of CA up to No. ID, passing thru OR and WA, makes transporting my protection effing insane! The Left Coast has lost it’s marbles! I suppose I could travel thru NV into ID, but that route is an hour longer! I can’t wait to flee this circus! That really captures my mindset now a days! Also here is one for ya all, Indian Reservations. One can transport through the Revs (as per feds law), but you CAN NOT STOP, not even to get fuel or lunch, you will be arrested and jailed for a very longgggggg time, especially if you’re the wrong color…. Plus you will NEVER see your firearm again, might as well dump into Navajo Lake along with mine. Have this manual. If you are traveling at all. Get it. I posted on this a long time back. New Jersey has the most restrictive laws in the country for guns. I forget now who the next state was etc. It pays to be in the know. I call the Attorney general offices for every state I’m about to cross. I have their department E-mail me the concealed carry laws or their travel requirements and the person who sent it. If pulled over by any law enforcement, I show them the paper with their phone numbers to verify. I’ve done this as well! Showing an officer or deputy a printed email from THEIR own AG goes a long way towards preventing misunderstanding… and misbehavior. Wolfgar, that sounds like a very good idea. Thanks. Heads up. As some may know, in a case out of Hawaii, the 9th said open carry was legal. The 9th appellate has accepted the case en blanc. Meaning that 11 justices will rule on the case. Be prepared for this activist court to make a country wide ruling banning open carry. They may expand their ruling to address other types of carry and transport. Another to be overturned by SCOTUS. Hopefully, a new Supreme Court Justice will be on the bench by that time. The 9th has to accept that they can not enact laws. Correct me if I’m wrong, but I was lead to believe this is not a case of open carry in public places (don’t know if it was state law or local law against this, maybe Tommyboy can help out here), but rather a case of not being allowed to carry out in the public view on your own property, outside the confines of your home. It’s not a case that would affect any states that allow open/constitutional carry, at most it would affirm the right of states within their appellate circuit to pass similar laws against open carry on one’s own property. Even so, whatever the 9th circuit rules will only apply to those jurisdictions within their purview, not nationwide. Last I checked, the 9th circuit has some 80% of their rulings overturned anyway. Firearms are one thing, magazines are another. A number of states have restrictions, recently enacted, which are subject to wrong-thinking zealous enforcement. 1) An over-capacity magazine. Let say hypothetically you are crossing state lines with a pistol with a 10 shot magazine (totally lawful in both your home state and the destination state), and travelling through a state that has a 7 shot magazine limit, and you get stopped by the police. Even if the magazine is with the gun, locked up I am not sure how that would be viewed. I can easily see disaster in this scenario. 2) You happen to be carrying a magazine in interstate travel with either no gun or separate from a gun. Arguably, a stand alone magazine is not considered a firearm. (Remember we are dealing with enforcement types from states that elect the likes of Elizabeth Warren and Ocasio Cortez). I read a story on the internet (yeah I know) about someone (an out of stater) travelling through Boston Logan on her way to another state who happened to have a bigger magazine in her possession than the MA law allowed. No gun. She even declared that she had it to TSA. I believe she was arrested and charged. How to handle that situation, other than wonder what the H*** happened to the state that in 1775 stood up to the British redcoats? It seems to me from a practical no-risk standpoint that the best approach travelling through these states in interstate travel would be to not have magazines in your possession that don’t comply with local laws. The lowest common denominator with a handgun is to either carry no magazine (rendering the gun useless!) or a compliant one (to local law) of low capacity, or a revolver with a capacity that does not go over the maximum capacity. And mail ahead any full-size detachable magazines. Wow, good questions. I never thought about the magazines. I have always just thought about the firearm itself and whether the firearm was legal to carry and if not, the legal way to store when traveling. So, if I have say a 200 round clip for my Glock 9mm, I guess I might have problems where it is legal to only carry up to seven rounds. I used 200 rounds because if seven rounds is the legal limit, it probably doesn’t matter if I had an eight round clip or a super max jumbo 200 round clip. Illegal is illegal I guess! The solution to this dilemma is don’t get pulled over. There is a reason I always drive the speed limit, signal every turn and lane change and maintain a several second following distance. As a result, I have never been pulled over in my 48 years of driving. Whatever happened to ” Shall not be infringed ” ? What ever happened to; the Government is to serve the people, and not the people to be slaves to the .gov? Power grab through “bread and circus” Now we are enslaved to “smart” phones so we no longer have to think, microwave ovens so we no longer have to cook, EBT so we no longer have to work, TV so we no longer have to read, … we traded our freedom for sloth.